at midnight in Bethlehem in the piercing cold. on November 30th, until Christmas will obtain what is asked. Michael Augustine Corrigan was the third archbishop of the Roman Catholic archdiocese of New York, in the United States, was born in Newark, New Jersey, on the13th of August 1839. In 1859 he graduated at Mount St Mary's College, Emmittsburg, Maryland, and began his studies for the priesthood as the first of the twelve students with whom the American College at Rome was opened. On the 19th of September 1863 he was ordained priest, and in 1864 obtained the degree of D.D. Returning to America, he was appointed professor of Dogmatic Theology and Sacred Scripture, and director of the ecclesiastical seminary of Seton Hall College at South Orange, New Jersey; soon afterwards he was made vice-president of the institution; and in 1868 became president, succeeding Rev . Bernard J. M`Quaid (b.1823), the first Roman Catholic bishop of Rochester. In October 1868 Corrigan became vicar-general of Newark, a diocese then including all the state of New Jersey . When Archbishop Bayley was transferred to the see of Baltimore in 1873, Pius IX. appointed Corrigan bishop of Newark. In 1876 he resigned the presidency of Seton Hall College . In 1880 Bishop Corrigan was made coadjutor, with the right of succession, to Cardinal McCloskey, archbishop of New York, under the title of archbishop of Petra; and thereafter nearly all the practical work of the archdiocese fell to his hands . He was at the time the youngest archbishop in the Catholic Church in America . On the death of Cardinal McCloskey in 1885 Archbishop Corrigan became metropolitan of the diocese of New York . He died on the 5th of May 1902 . **Remembering the man, priest, and archbishop that placed the Impramatur on this beautiful Christmas Novena. Let us remember the beauty of his vocation and the blessings he left us in this Year of the Priest. May God bless you Archbishop Corrigan and may you pray for us also. 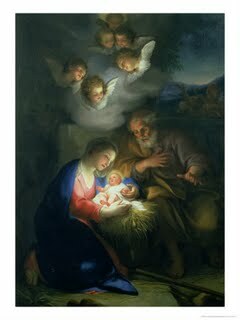 This entry was posted in Uncategorized and tagged Archbishop Corrigan, Christmas novena, memory by t garcia. Bookmark the permalink.